Do you want to get organized on a budget? Me too! You’re going to love these cheap organization hacks and organizing tips. Make a difference in all areas of your home, don’t spend a lot while you do it! Despite the fact that we moved into a new house only eight months ago, I’m still trying to get organized. I get to this point in every move I’ve done where I’ve past the purging stage. When I reach my final destination I have to go through my things again . . . and then getting organized becomes a constant process that never seems to end. The nice thing about moving into a new home is that I can start from scratch. The catch is that I can’t spend a ton of money – I just bought a house! I don’t want to break the bank getting everything organized, so I’ve been gathering relatively inexpensive organizing tips that I know are going to come in handy. I want to share what I’ve found, and maybe these will help you too. 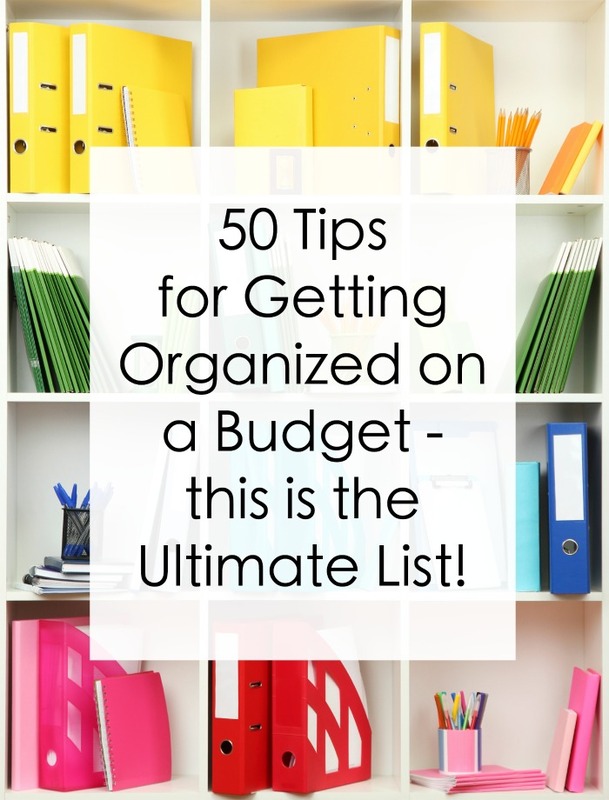 If you need the ultimate guide to get organized on a budget, this is it! These 50 tips will come in handy for many rooms in your home. 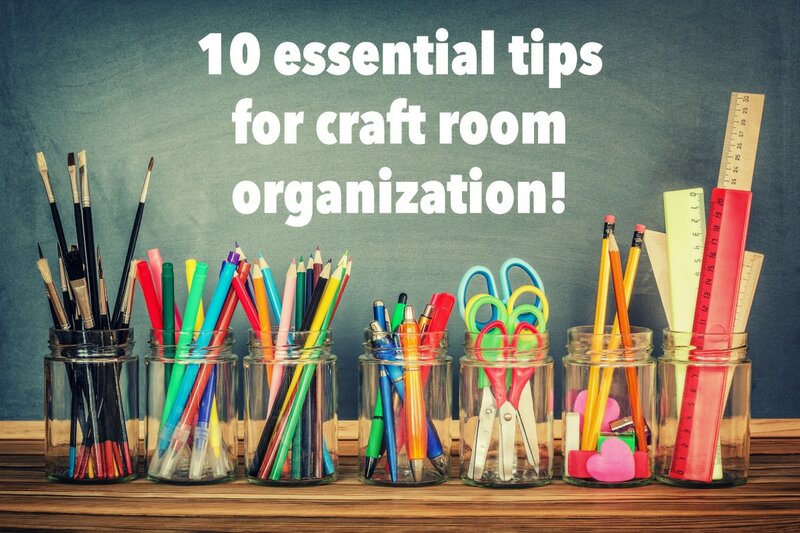 Check out this list and I can’t wait to hear which organizing tips are your favorites! Recycle old pickle jars by spray painting the lids and adding handles to the top. Great for storage, and pretty too! Add a clear shoe organizer over the back of any door to organize small items – toys, craft supplies, and more. 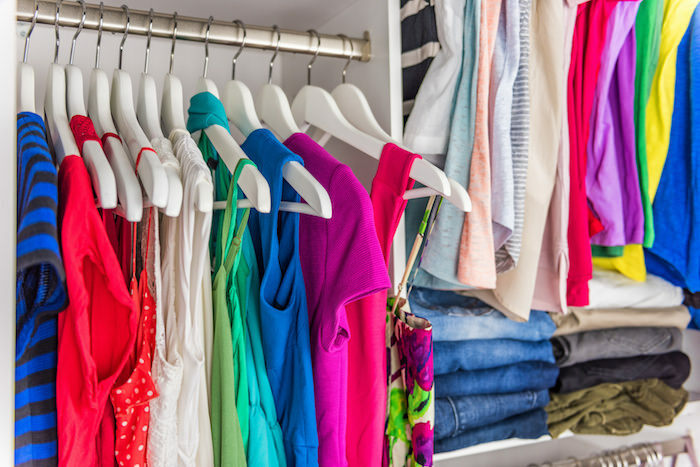 Purchase huge Ziploc storage bags for winter and summer clothing – switch out your wardrobe as needed, keeping your closet more organized and accessible during each season. Store jewelry in a clear pill container. This solution is perfect for travel. Add a pegboard and peg hooks to any wall, turning it into instant storage space. Don’t keep your magazines – instead, rip out individual pages and keep them in a file folder for future reference. Plastic bag holders you can mount to the wall are perfect for storing wrapping paper. 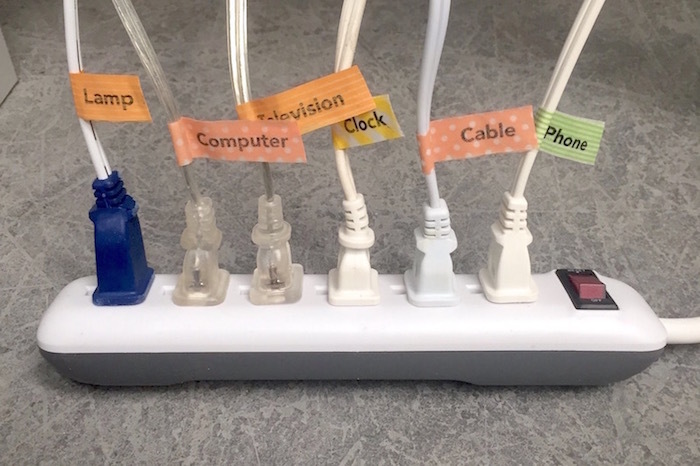 Label your phone (and appliance) cords with washi tape – give each person in your home a different color so you know whose is whose. You can also sort type by color as well! Get organized by adding collapsible bins to your car trunk for storage right when you need it! Fold the down when you aren’t using them to keep them out of the way. Store your greeting cards in tabbed, expanding file folders organized by month and/or occasion. Keep paint chips, recipes torn from magazines, local menus, and other household essentials in an accordion file in the kitchen for easy access. In your laundry room, hang a wire between two nails. Add clothespins and use to hang wet clothing including socks, gloves, hats, and raincoats. Use recycled baby food jars to hold spices – you can store them in a drawer upside down or stack and get organized in a cabinet. Purchase a three ring binder for instruction manuals and keep in the kitchen (works for menus as well). A shower tension bar works well as an under-the-sink organizer – you can hang bottles by their handles. One of my favorite organizing tips for a deep pantry is to use a lazy susan. You can spin it to see what you have and keep items from getting stuck in the back. Use a large amount of small, clear containers for quick and easy cleanup of your pantry (just add printable labels). 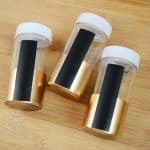 Instead of printable labels, you can also use chalkboard labels to make sure you know what is in each container – erase when you change what’s inside! Decorate a 12″ by 48″ board with clothespins (use hot glue to attach them) so you can hang chips and other snacks off of it. Makes the goodies easy to see and grab. 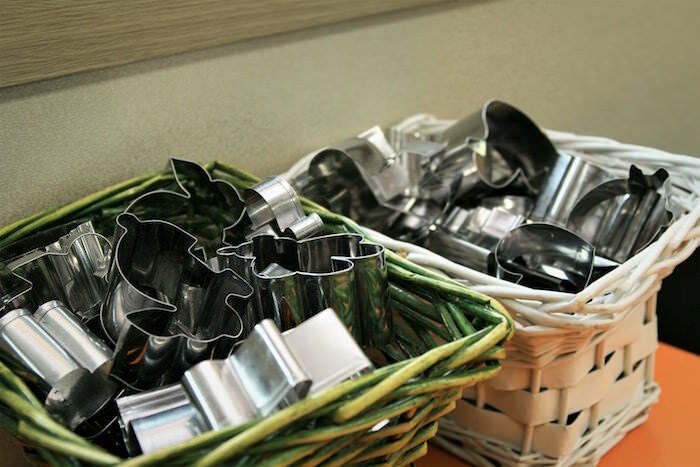 Cookie cutter tubs can take up a lot of cabinet space – use paper towel holders that attach to the wall to organize them instead (slide them onto the stem)! Add cup hooks underneath your cabinets for mugs – taking advantage of the extra space inside. Bamboo skewers packed into a container are perfect for holding knives and other random utensils. Use a plastic tray to get organized on top of cups or mugs – you’ll give yourself another layer of storage. If you save old plastic shopping bags like I do, an old Kleenex box is a perfect place to store them until you need them. 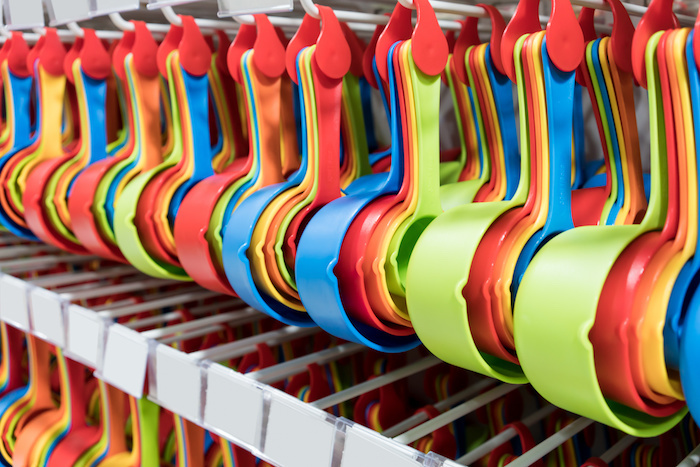 Use Command hooks on the back of your pantry doors to organize measuring spoons and cups. 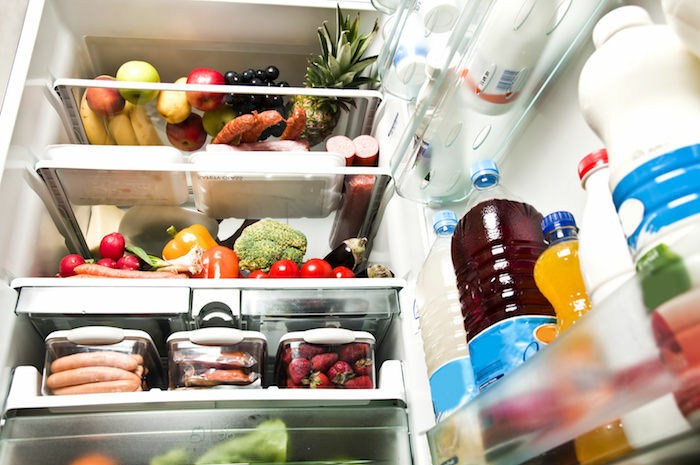 A soda can dispenser can be an invaluable tool for getting more space in the fridge. Buy several small trash cans and make a recycling center in your kitchen, as opposed to buying one made for recycles. Those are typically way more expensive. Use magazine holders to get organized in your pantry. Add printed recipes and cookbooks to the holders. Recycle small glass jars to hold cotton swabs, balls and other essentials inside your bathroom vanity drawers. Give each member of the family a plastic shower caddy for their essential items (and for easy storage and access under the sink or in cabinets). Use a rolling cart for beauty products that you’ll use on a regular basis – separate items by shelf. Mount mason jars in the bathroom under a cabinet or on a board with clamps for easy access to small items like q-tips and cotton balls. Use ice cube trays to hold office supplies in your drawers. Recycle chip canisters into a desk organizer that can hold brushes, pencils and more. 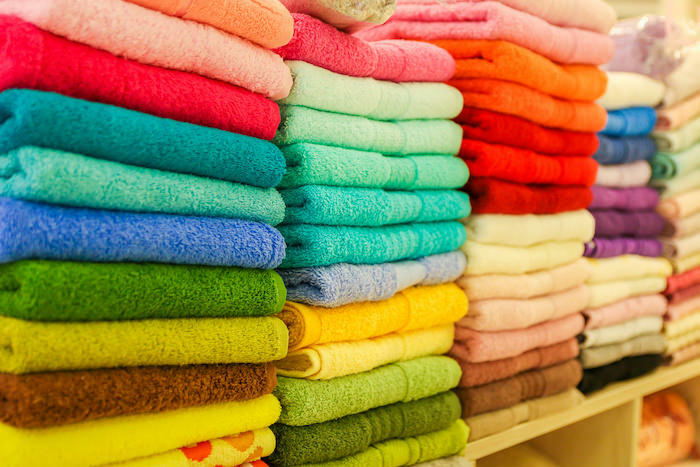 Use shower caddies in a closet for storage. Simply hang with a picture hanger and nail. Small plastic containers or caddies are perfect for grouping cleaning products upright in cabinets and keeping them from tipping. Keep sheet sets organized by folding and storing the fitted sheet, flat sheet and pillowcase inside the second pillowcase. Instead of purchasing clear shoeboxes, you can keep the cardboard box your shoes came in and cut out a panel at one end so you can see (also provides ventilation). Standing sectioned mesh hampers are perfect for yarn and deco mesh storage. 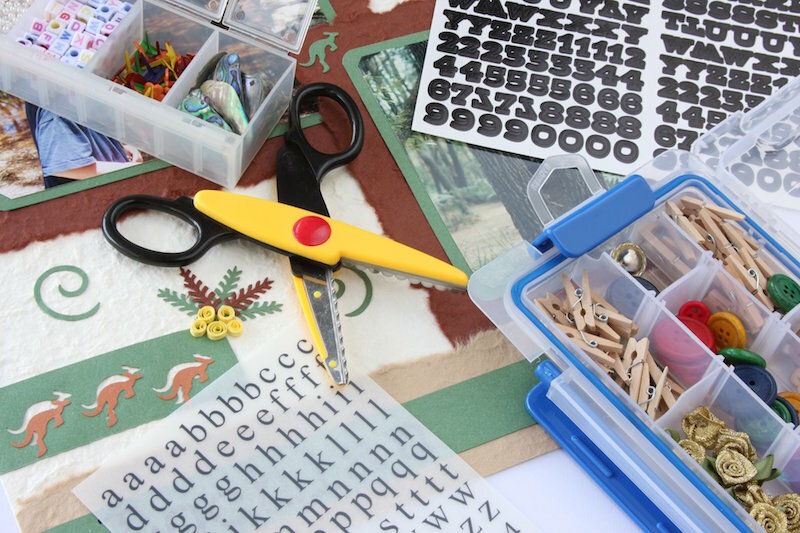 Use recycled tin cans or Crystal light containers for craft paint and/or markers. Use clear plastic scrapbook paper holders to make your scrapbook papers visible and easy to access. You can also use binder clips in the closet – just clip to hangers. Glue wooden candlesticks to the bottom of pie tins (with E-6000) to make the perfect tiered storage for any loose craft supplies. You can get creative and decorate the candlesticks, too. Put your glitter in salt shakers – it’s the perfect way to store the glitter and use it without dumping out the whole container. An old toothbrush holder becomes a great way to hold scissors and tools. 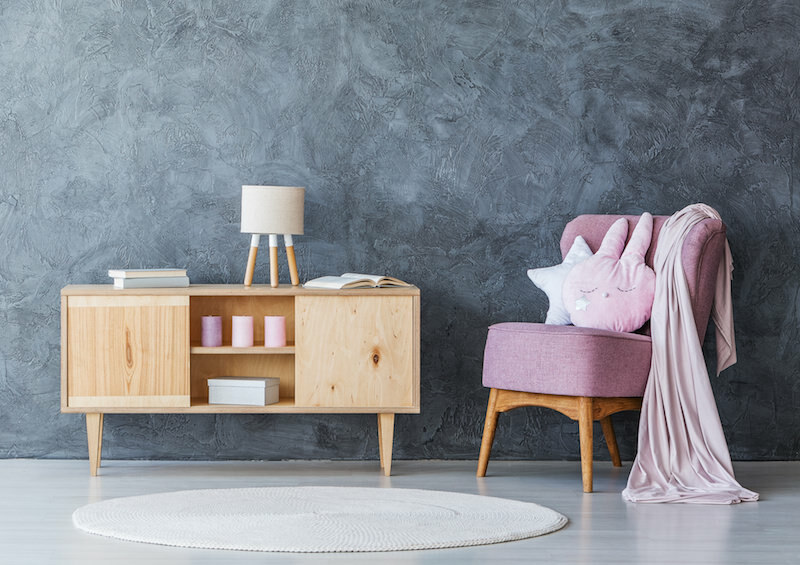 Store blankets and other small items in your living room in inexpensive (but attractive) ottomans. A pop up laundry bin makes for amazing stand-up toy storage. Turn an old picture frame into a jewelry rack by removing the back and stringing thin wire across, gluing on each side. Create a scarf organizer by adding clear plastic shower rings to a hanger. This is one of those organizing tips you can use for ties and belts as well. Paint a wall in your home with chalkboard paint and use it as a scheduling station. Revamp your mudroom or laundry room by giving each person their own basket, so everyone knows where to drop off/find their personal on-the-go essentials like keys, bags, homework, etc. It’s a time saver too! 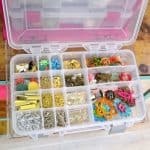 These are my absolute favorite organization tips, and I know there are a lot of them, but I also know there are many more. I’d love to know your favorite tips to get organized in the comments below! If you liked this guide, I have essential tips for craft room organization over on Mod Podge Rocks. Just click the image below to see them!